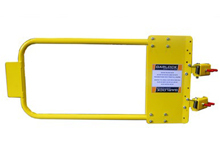 Enhance facility safety with this self-closing gate that has an adjustable width of 30" - 36". Constructed of sturdy welded steel and a spring loaded closure mechanism. This gate easily and securely clamps onto most 1" - 2" diameter round or flat posts and rails. Add to existing hand rail, guard rail openings and facility entries to help prevent dangerous falls from raised platforms like mezzanines and work platforms. Finish: powder coat yellow. Adjustable Width: 30" - 36"